This week we’ll be talking you through pitches and presentations. First impressions are important, so we figured we’d start the week with an infographic. Why? They look nice. Useful too. 1. Know Your Stuff: Be prepared to describe the size of your market, who the major players are, their market share and how your offering will be different and make customers want to switch. 2. Go Beyond PowerPoint: How many customers do you have? What’s your customer-acquisition cost? What are your revenue projections? How much free cash flow is the business generating? If you can’t supply these basic financial metrics, you’re out. 3. Be A Mover and A Shaker: For hand shake beginners, check out WikiHow. For the more experienced, avoid these hand shake mistakes. This point is only half tongue-in-cheek. 4. 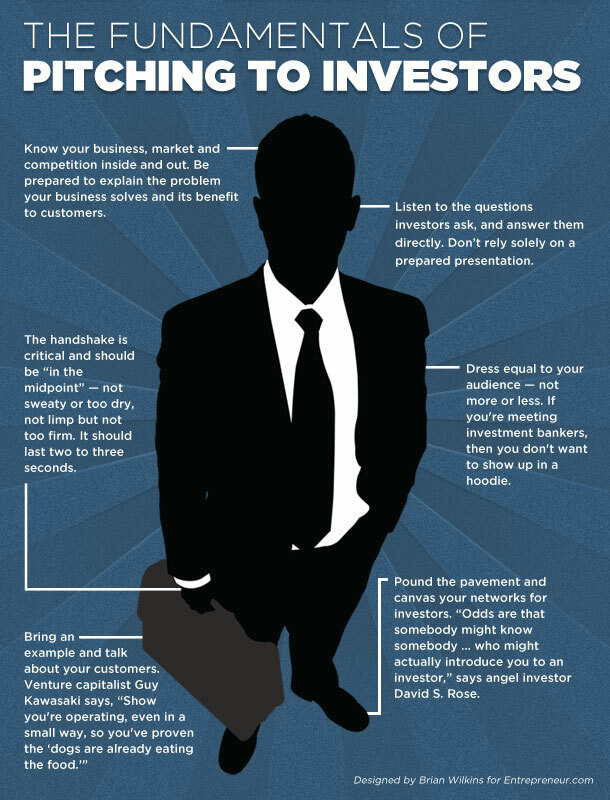 Dress For Success: Forbes have a good post on this. A rule of thumb? Don’t dress like an avocado. 5. Go In With A Version: It’s ok if your 1.0 release is a little rough around the edges, so long as it still creates value for customers. Of course, it’s probably not so ok if you’re a pharmaceutical company. 6. Look Within Your Network: While cash is great, expertise is invaluable. Most investors have an industry they know well and they make most of their investments there. Look in yours.